Reichel Stohry LLP is located in the historic Stutz Building in downtown Indianapolis, Indiana. 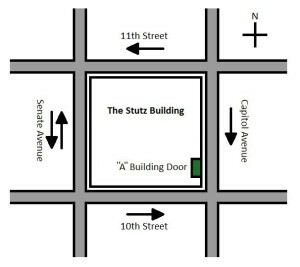 The Stutz Building occupies an entire city block and is bordered by 11th Street, Senate Avenue, 10th Street, and Capitol Avenue. Entry to our office is available from Capitol Avenue between 10th Street and 11th Street. As shown in the map, you can visit us by entering the “A” building door just north of 10th Street on Capitol Avenue. Take the stairs just inside the doors up one flight to the second floor, enter the door to the second floor, and our office (Suite A-285) is at the end of the hallway on the left. Should you require an elevator to the second floor, please call before you arrive and one of us will meet you at the door to the “A” building and guide you to our office. Our mailing address is 212 West 10th Street, Suite A-285, Indianapolis, IN 46202. Metered parking is available on both sides of Capitol Avenue.